Image caption The Home Office said the policy was "never targeted at people with a lawful right to be in the UK"
A trial to force landlords to evict tenants who lose the right to live in the UK has led to "increased racial profiling", a charity says. The Right to Rent policy to tackle illegal migration is in force in the West Midlands, with plans to roll it out nationally. The Joint Council for the Welfare of Immigrants said it found 17 cases of discrimination. The Home Office said anyone who discriminated was breaking the law. It said landlords were advised to check the identity of all new tenants, but the Joint Council for the Welfare of Immigrants (JCWI) said checks appeared to target those who "appeared foreign". 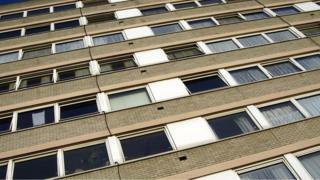 Private landlords in Dudley, Sandwell, Wolverhampton, Walsall and Birmingham have been part of a trial in which they have to conduct checks to make new tenants have the right to rent in the UK. Landlords falling foul of the rules face fines of up to £3,000. The trial is to be expanded nationally in the upcoming Immigration Bill. The JCWI evaluated the policy between December and July. It surveyed landlords, agents, tenants and lodgers - with 76 responses. It also gathered evidence from organisations in the sector. Survey responses and organisations suggested checks were not being carried out uniformly but were directed at certain individuals, said the JCWI. Some tenants had been charged handling fees for their landlords to carry out mandatory checks, the JCWI said. In other cases landlords "passed the cost of a potential fine on to the tenant" in increased rents or deposits. The JCWI said the trial was during the "quietest seasonal period for new private residential lettings" so the impact of rules at a busier time could not be foreseen. Saira Grant, the JCWI's legal and policy director, wanted the scheme to be scrutinised by Parliament before a national rollout. She said: "Our evaluation shows direct discrimination by landlords against those legally here, but with complicated or unclear immigration status. These checks are leading to increased racial profiling." The Race Equality Foundation added: "The Right to Rent checks system gravely concerns us. We risk bringing back widespread discrimination." The Home Office said the policy was "never targeted at people with a lawful right to be in the UK". A spokeswoman said: "Landlords are advised to check and record identity documents for all new tenants. Anyone who discriminates would be breaking the law. "An expert consultative panel, which includes the Equality and Human Rights Commission, as well as representatives of landlords and letting agents, is advising on the implementation of the first phase of the scheme."